Circular blades, continuous rim blades, gulleted edge blades, saw blades, side spoked blades, super speed blades, circular blades, clover leaf blades, rotor saws, integral spindle saws. Larger diameter blades than those listed below are available. Different arbor hole sizes are also available. 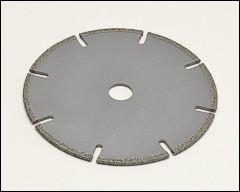 Please call us for pricing on any additional sizes of these blades that you use. Used where it's necessary to cut close into a corner. The blade and integral spindle are one piece to present an absolutely flush side to the work. The F5030 is fully covered with diamond on the front and back. All other sizes have a 1/4" wrap Additional shank options are available. 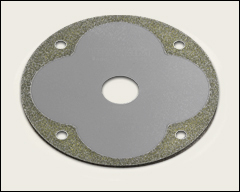 Most widely used blades for general purpose cutting. All are Diatrim blades. Recommended for material over 3/4" thick. Recommended for thicker material or slightly curved cutting. Prevents saw from jamming in the cut. Super-speed blades provide the benefits of side-spoked and gulleted blades, plus a wide band of diamond so you can sand parts without changing tools. Clover leaf diamond blade provides better performance for radius cuts.